With the announcement that Mahathir is the opposition’s pick for prime minister should they win the next election, UMNO can expect a credible challenge on its home turf, says Penang Institute’s Dr Ooi Kee Beng. KUALA LUMPUR: Malaysia’s parliament will be dissolved sometime during the first half of 2018. That is a legal certainty. 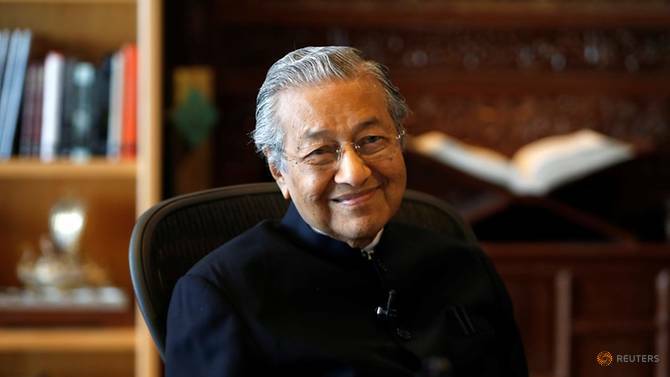 The general election that is to follow within two months after that will be the third to be held since Dr Mahathir Mohamad retired as prime minister in October 2003. It will also be one where the 93-year-old doctor will attempt to become prime minister again, now that the opposition has named him their pick for the top job should they emerge victorious. Even if he does not succeed in this audacious attempt, what Mahathir has managed to do after leaving UMNO is nothing short of astounding. Mahathir’s sense of strategy is clearly as sharp as it has always been, and one should certainly not underestimate his reading of the political dynamics of the country today. This is a man with his finger on the pulse of Malaysian politics. Like a master chess player, he left the tournament circuit in 2003 before he could be defeated. Now he returns, a wild card that makes it into the finals. It is not so much Najib Razak that the opposition coalition Pakatan Harapan is trying to unseat. It is UMNO. This is important. At this point in time, Najib is less popular than the party he leads. In that sense, the prime minister is living off the glory of the party’s earlier days and the Malaysian public’s memory of its old accomplishments. Resigning from UMNO was the first step Mahathir took following his largely ineffective criticism against Najib’s administration from within the party. He had also resigned in 2008 when Abdullah Badawi was prime minister but rejoined when Najib took over in 2009. A resignation by Mahathir is not a throwing in of the towel but a declaration of war. What is vitally different this time around is that Mahathir has not only given up on UMNO, deeming it to be beyond redemption. He has also managed to make common cause with the opposition, which over the last decade has shown itself to be a plausible countervailing force to the ruling coalition, the Barisan Nasional led by UMNO. A master strategist is one who waits and strikes; and then waits again for the next opportunity. As Najib came under pressure from within and without in recent years, and as he acted against his attorney-general, his deputy prime minister and other UMNO leaders, Mahathir knew to pick up the pieces, and was soon able to spring a surprise on the world. His next strategic step was to found a new party, and so, Parti Pribumi Bersatu Malaysia (PPBM) was officially established on Sep 7, 2016. Fifteen months down the road, on Dec 29, 2017, that party managed to hold its first annual general assembly. It is equally telling that this new party was not created to be a racially inclusive one. Not only did Mahathir make PPBM a Malay party like UMNO, even if it does allow non-Malay associate members – the uniform chosen for its annual general meeting (AGM) was red, the traditional colour seen at UMNO AGMs. Both concretely and symbolically, PPBM is challenging UMNO on UMNO’s home turf. Whatever other principles Mahathir may live by, he knows that to win in politics as in chess, you need more than kings, queens, bishops, knights and castles. You also need foot soldiers. And you need a constituency. Mahathir is no Don Quixote. He does not fight for the sake of fighting. He fights to win, and before striking, he identifies his enemy’s weak points even as he strengthens his allies. The alternative discourses of multiracialism and good governance are campaign narratives that have been captured effectively by other opposition parties such as the Democratic Action Party (DAP) and by Anwar Ibrahim’s Parti Keadilan Rakyat (PKR). So another Malay-led multiracial party is not likely to win over any new body of voters. In fact, it would only lead to further internal contest among opposition parties. So the voters to gun for are UMNO’s more devoted supporters, plain and simple. This is what Mahathir knows to bring to the table. Indeed, his moves to win over his old enemy, Anwar Ibrahim and his supporters, is a study in masterful strategy. Despite being the sworn enemy of the opposition for so long, Mahathir went on a charm offensive to convince the opposition forces arrayed around Anwar, originally to fight Mahathir himself, that the future of Malaysian politics depends on them working together. This he has managed to do, partly because the opposition leaders were at their wits’ end after Najib managed to lure Parti Agama SeMalaysia (PAS) to his side, acceding step-by-step in the process to a conservative Islamic agenda. This is not an easy game to master, and in going down that path, Najib may have pleased conservative segments of the Malay population, but he has upset many others at the same time, including some of the sultans and many older civil servants. These provided more pieces for Mahathir to pick up. Not all are for the picking, no doubt, especially the monarchs whom Mahathir badly affronted during the 22 years he was prime minister. Anwar’s PKR and the coalition that he had built could only go so far, and win only that much support. The biggest hurdle the now-defunct Pakatan Rakyat faced was the unwillingness within key segments of the Malay community to ditch UMNO. UMNO to them is synonymous with the Malays’ special position and has been seen, rightly or wrongly, as the protector of Malay culture. Calling for good governance can only attract a certain segment of Malay voters. What Mahathir realises is that although Malay support may shift away from UMNO on the issue of good governance, it can do that only to a limited extent. And that limit has been reached. In this context, racial appeal is also needed. What PKR stands for, associated as strongly as it is to the DAP, is too vague and detached from the daily lives of many Malay voters, especially those in more rural settings. With PPBM as a key member of Pakatan Harapan, the coalition’s ability to appeal to the Malay community has been strongly enhanced. Mahathir then went the extra mile at his new party’s first AGM, and apologised publicly for his past wrongdoings. His strategy to place himself at the head of the opposition and to be its prime ministerial candidate has now been amazingly secured. Furthermore, the agreement within Pakatan Harapan to commence legal proceedings to obtain a pardon for Anwar has softened resistance to Mahathir heading the opposition. How sincere Mahathir’s remorse is and whether he can reconcile genuinely with old enemies in the opposition are not the issues here. Dissociating the Malay community’s interests from UMNO’s party interests in the minds of rural Malays is, and for that, it is the key to toppling the Barisan Nasional. To what extent Mahathir’s leadership of the opposition succeeds in doing that will be given an irrefutable answer in the exciting general election to be held later this year. Dr Ooi Kee Beng is the executive director of Penang Institute. His recent books include Merdeka for the Mind: Malaysian Struggles in the 21st Century, Done Making Do: 1 Party Rule Ends in Malaysia, and Between UMNO and a Hard Place.